On February 2, 1864, Confederate troops engaged the men of the 9th Vermont Infantry at the Newport Barracks in Carteret County. The 7th Regiment North Carolina Infantry built the barracks south of Newport for quarters in the winter of 1861 and 1862. Shortly thereafter, the cluster of log huts was captured by Union troops, who added a hospital, headquarters, stables, storehouse and earthworks. Newport Barracks effectively became a Federal supply depot, since it was located near both the Atlantic Ocean and railroad tracks. In January 1864, 2,000 Confederate troops under the command of General James G. Martin advanced from Wilmington toward Morehead City to support General George E. Pickett’s mission to regain control of New Bern. They reached the barracks on February 2. Company D of the 2nd Massachusetts Heavy Artillery, stationed inside Newport Barracks, prematurely abandoned their posts and retreated as the Confederates advanced. The commander of the 9th Vermont set fire to the depot and followed suit. The fleeing troops also burned the railroad and road bridges. The skirmish was largely indecisive, though Martin’s men managed to capture 30 Union troops and gather some supplies and equipment from the barracks before they were destroyed. When the Confederate troops learned of Pickett’s failure at New Bern, they returned to Wilmington. The Carroll A. Deering. Image from the N.C. Maritime Museum. On January 31, 1921, the impressive five-masted commercial schooner Carroll A. Deering was found wrecked on Diamond Shoals off Cape Hatteras. At the time, she was returning to Newport News from a trip to Brazil. Built in 1919 by the G. G. Deering Company in Bath, Maine, the ship was among the last wooden schooners built before their eclipse by iron shipbuilding. Two days before the discovery of the wreck, the Cape Lookout Lighthouse keeper reported seeing the ship. On the morning of the 31st, the Coast Guard discovered the foundered boat, ostensibly abandoned. When the seas calmed four days later and the Coast Guard was able to reach the ship, it was clear the vessel had been abandoned—the crew and their navigational equipment, belongings, documents and lifeboats were all gone, but interestingly dinner was on the stove and the captain’s cabin was a mess. A few months later, the ship was hauled from the rocks and dynamited so it wouldn’t be a hazard to mariners in the area. The mysterious circumstances of the wreck became the subject of investigation which included a visit to Dare County by the FBI. Various explanations for the wreck surfaced, including the effects of the Bermuda Triangle, Bolshevik pirates and mutiny. All of these explanations were discredited by investigation, and the cause remains a mystery. On January 30, 1871, Gov. William Woods Holden’s impeachment trial began. The only Chief Executive in North Carolina history to be impeached and removed from office (and the first in the nation), Holden was a central figure in the state’s Civil War and Reconstruction era. Holden was the editor of the North Carolina Standard, a Democratic newspaper based in Raleigh, and used the paper to help lead Zebulon B. Vance to victory in the gubernatorial race of 1862. In 1864, Holden ran against Vance and suffered a humiliating defeat. On May 20, 1865, President Andrew Johnson appointed Holden provisional governor, though he lost the election to the seat that fall. He made a final bid for governor in 1868 and successfully attained his goal. Vowing to destroy the Ku Klux Klan, he made several decisions that led to racial violence and the imposition of martial law in Alamance and Caswell Counties,effectively ending his political career. Notified that he had been impeached by the House of Representatives, Holden turned the duties of his office over to Lieutenant Governor Tod R. Caldwell on December 20. The trial lasted nearly three months. On March 22, 1871, the North Carolina Senate ordered Holden removed from office. On January 24, 1759, a group of men from Halifax and Edgecombe Counties rode to Francis Corbin’s house in Edenton and seized him during the night. The men were upset because Corbin had extorted money from them when collecting rents for Lord Granville who controlled the land on which they lived. Corbin was taken to Enfield, where he was held in jail with his co-conspirator Thomas Bodley. The pair was forced to pay a bond as a guarantee to appear in court in the spring and agree to new rules governing rent and tax collection. Furthermore, they promised not to sue their captors. During the court session, Corbin and Bodley were released after they promised to return all illegal fees and taxes they collected. Though Corbin eventually was removed from office by Lord Granville, the Colonial Assembly investigated the incident, now called the “Enfield Riot” and punished some of the “rioters” severely, imprisoning several. In response, sympathizers and friends broke the imprisoned out of jail. Modern historians considered the actions of the Halifax citizens as a foreshadowing to the War of Regulation. On January 20, 1779, the North Carolina General Assembly abolished Bute County less than 15 years after establishing it. James Stuart, 3rd Earl of Bute. Image from the National Portrait Gallery, London. nobleman, Bute was the tutor of Great Britain’s Prince George. 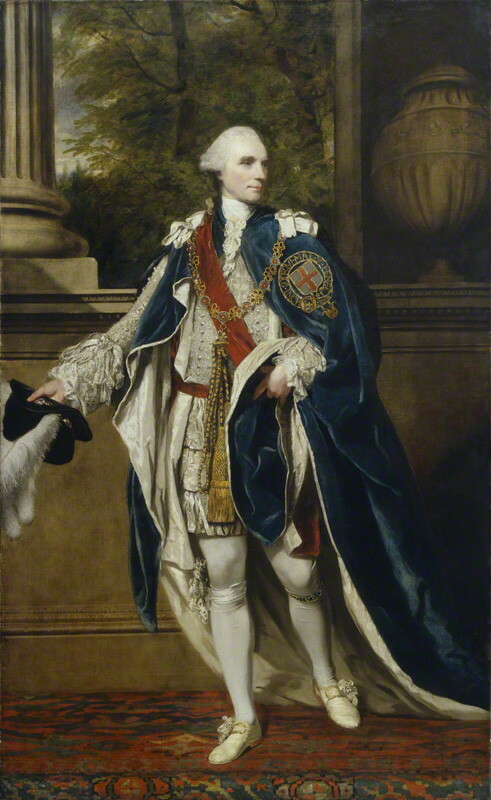 After the prince became King George III in 1760, Bute served as the king’s advisor and eventually became prime minister. Carved from eastern Granville County, Bute County provided the residents of the area better access to local government. In 1766, the legislature expanded the county by annexing part of northwestern Northampton County. By the late 1760s, though, the Earl of Bute had become very unpopular with Americans. Many blamed him personally for instituting the 1765 Stamp Act. With Bute County’s population growing, support for dividing and renaming the county grew during the mid-1770s. After two years of discussion, the General Assembly decided to divide Bute County along Shocco Creek with the northern part becoming Warren County and the southern part, Franklin County. With the incorporation of the two new counties, Bute ceased to exist. The courthouse that once served Bute County no longer stands. A generator powered the public address system and the single light bulb that illuminated the speaker’s immediate area. With only the dim light, the Klansmen, numbering less than 100, could not see the hundreds of Lumbee, some armed, surrounding them. The two groups clashed and struggled over the light bulb until a gunshot shattered it. More gunshots rang out in the darkness as the Lumbee routed the Klansmen from the field, ending the night’s event. Police arrested the Klan leader, James “Catfish” Cole, for inciting a riot. He was convicted and served a year in prison. The incident garnered national attention in contemporary news outlets, including a three-page spread in Life magazine. Several images captured the unfolding events and the aftermath, including a triumphant Simeon Oxendine wrapped in the captured KKK banner. Oxendine was a prominent Lumbee community leader and a World War II veteran who flew more than 30 bombing missions. The first X-ray taken at Davidson College. Image courtesy of the Davidson College Archives. On January 12, 1896, three students at Davidson College experimented with x-rays. On January 6, 1896, the Associated Press announced that German physicist Wilhelm Roentgen had discovered a new form of radiation. While experimenting with cathode rays, he discovered that mysterious “x”-rays passed through a variety of objects. He put his hand in front of the rays and saw the silhouette of his bones. At the time, many physics labs had equipment to duplicate the x-ray. Henry Louis Smith, a physics professor and future president at Davidson, was the first professional in North Carolina to work with x-rays. It was actually a group of Smith’s students who appear to have been the first people in the state to perform x-ray experiments. Three juniors professed to having bribed a janitor to let them into the building housing the physics equipment just six days after Roentgen’s announcement reached America. The students placed objects on photographic paper taking photographs, or what were called roentgenograms, of objects including an eggshell with a button in it, a rubber-covered magnifying glass, a cadaver’s finger, pins, cartridges and paperclips. Years passed before the students’s escapade was made public. The original x-ray images are now housed in the Davidson College Archives. The experiments are the subject of a highway marker in Mecklenburg County.